A Church of Christ in San Jose was born. Founded by Jesus and Mr. William Jessup. We called him “Brother Bill”. The sanctuary, God would fill. Then constructing Central Christian Church, which grew. Believers continue to live in Him. As “Amazing Grace” is still preached. Built up in Him – when the going gets rough. The Word of God is caught. Central Christian Church still thrives. Grateful for how the Lord provides. A Central Thought © 2014 by Charles B. Mayes. All Rights Reserved. 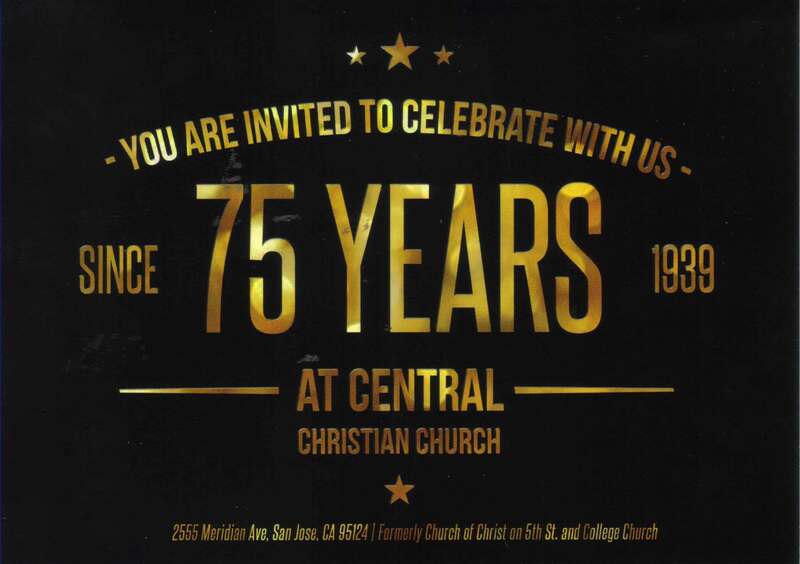 I have been privileged to attend 75th Anniversaries of two congregations in my life. The first was my home church, where I grew up – First Christian Church, Muskogee, OK (which is now York Street Christian Church). Right before the good successful merger becoming York Street, it was 99 years old! The second was today at my current home church, Central Christian Church, San Jose, CA. It was a wonderful time of reunion including when former Pastors Don Hinkle and Bryce Jessup spoke. There is something about a home church that is very important to Christians. It is a place “where everybody knows your name, and they’re always glad you came” * as that old TV show lyrics say. But this is nothing like that show about attempted happiness. It’s a place that you can always feel true joy, being close to God and each other. This is “real fellowship” as Don Hinkle said. * “Cheers” lyrics – as used in a past sermon by Don Hinkle.